Ahoy matey! Thinking about buying a boat? Join the armada. According to the U.S. Coast Guard’s National Recreation Boating Survey, there are nearly 22.3 million recreational boats in the United States. Those vessels range from one-person kayaks up to 200-foot mega-yachts. They can be found adrift on calm lakes in the Midwest or sailing through high seas off the coast of Alaska. Some are used for fishing, others for water-skiing, others for bird-watching. Some are pretty much just meant for throwing huge parties. Need some help buying that dream boat? Find a low-APR boat loan with our rate comparison tool. Read the fine print. Many states have special laws that cap sales taxes on boat purchases. In Florida, the cap is $18,000, which yields huge savings on six- or seven-figure yachts, but isn’t as helpful when purchasing smaller powerboats. In South Carolina, the cap is just $300 dollars. That means the effective sales tax rate on a $50,000 boat would be 0.6%. Nice! Florida, Texas and Virginia are top boat states. These three account for nine of the top 10 cities in our study. They all have ample open water, warm weather and relatively low taxes on boats. The southernmost city in Texas, Brownsville has a humid subtropical climate that yields great boating weather throughout the year. The Gulf of Mexico is easily accessible through the Brownsville Ship Canal. There are also a number of nearby lagunas and lakes that are perfect for seeing wildlife. What separates Brownsville from the other cities on this list, however, is the cost of living. Housing costs in Brownsville are roughly 30% cheaper than many of Florida’s coastal cities. Boating enthusiasts could spend that extra cash to buy… a bigger boat. Would you prefer watching the sunset over the Gulf of Mexico from your boat? 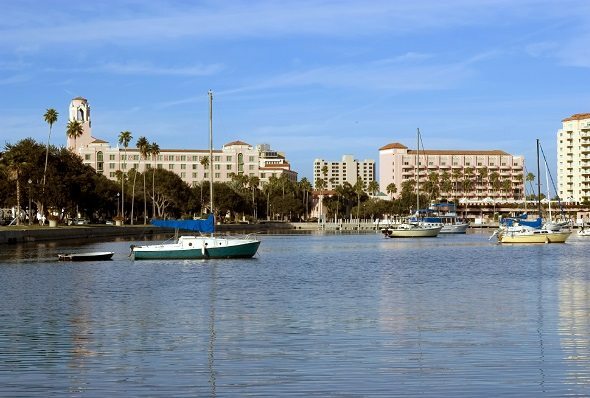 Head east to Saint Petersburg, Florida. Located on Tampa Bay, Saint Petersburg averages less than one day a year in which the maximum temperature does not exceed 50 degrees. It also has extensive shoreline, and is a great spot to launch a deep sea fishing expedition. Find out now: What are the sales tax rates in Florida counties? Corpus Christi is home to one of the most famous boats in the country, the USS Lexington, a World War II-era aircraft carrier. The ship was decommissioned in 1991 and now functions as a floating naval museum. It became a national historic landmark in 2003. Even if you can’t afford an aircraft carrier of your own, Corpus Christi is a great place to have a boat. The city, which spans the southern length of Corpus Christi Bay and extends out to Mustang Island, has the highest water area of any city in our study. Sales taxes on boats in Florida can be a bit complicated. There’s a statewide sales tax of 6%. Local county sales taxes of 0% to 1.5% also apply but only to the first $5,000 of the purchase price, effectively capping local taxes at $75. Furthermore, there is an overall cap of $18,000 on all sales taxes paid. So, if you buy a $20 million dollar boat in Florida your sales tax bill will be $18,000. That’s a tax rate of 0.09%. 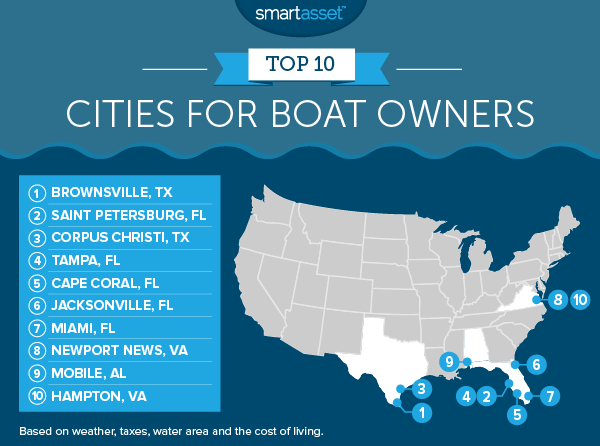 Low taxes are only one reason Tampa is a top five city for boat owners, however. The convenient location on Tampa Bay makes it easy to get out on the open seas. The warm climate makes it comfortable to do so any time of year. Is Florida really that great for retirees? SmartAsset has the answer. Want to own a home with its own dock? Cape Coral may be the place for you. The city boasts more than 400 miles of navigable waterways, many of them winding through residential neighborhoods. Park your vessel at the edge of your backyard and go for a cruise whenever your heart desires. The top-ranked city that isn’t located on the Gulf Coast, Jacksonville ranks in the top 100 on all five of the metrics SmartAsset considered. Located at the mouth of the St. John’s river along the Atlantic Coast, it also rates among the top 10 U.S. cities for its total water area. According to the U.S. Census Bureau, Jacksonville has 127.6 square miles of water within city limits. When it comes to ritzy boat culture, it is hard to top Miami. There are of course numerous privately-owned yachts, but there is also a large fleet of charter yachts in Miami. Chartering a 45’ yacht for a day costs around $2,500, plus sales tax of 7% and a tip for the crew. The sales tax rate on boats sold in Virginia is 2%, with total taxes capped at $2,000. That places the Virginia cities in our analysis in a tie for the eighth-lowest boat tax in the country. Aside from the low taxes, Newport News rates well in large part because of its location at the nexus of three separate bodies of water. It sits along the shores of the James River where it meets the Chesapeake Bay, which in turn meets the Atlantic roughly 25 miles further east. That provides ample opportunities for fishing (saltwater and freshwater), wildlife viewing, sailing and any other form of aquatic recreation. Situated along Mobile Bay at the mouth of the Mobile River, the city of Mobile has lots of open water. It ranks ninth in our study with 20 square miles of water area for every 100,000 residents. It is also a very affordable place to live and own a boat. Median annual housing costs in Mobile are $9,552 according to the U.S. Census Bureau. That includes property taxes and utilities, along with mortgage or rental payments. 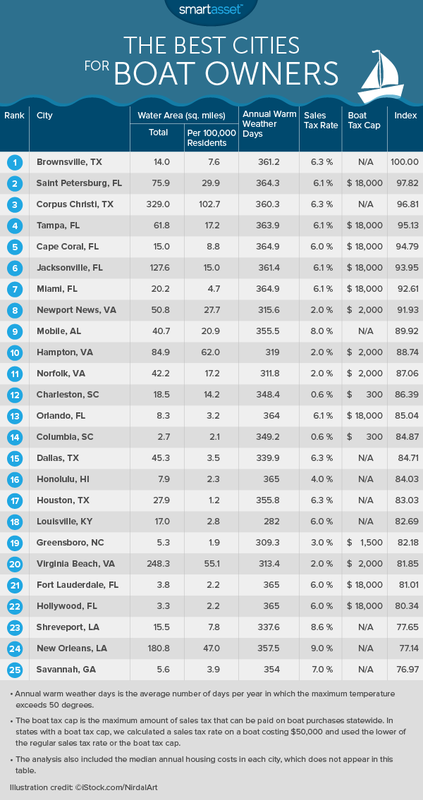 It makes Mobile the 26th most affordable city in our study. Like its neighbor city, Newport News, Hampton is ideally located for a seafaring lifestyle. The Chesapeake Bay in particular is a body of water famous for great sailing and fishing (and crabbing). Kayakers will enjoy the wildlife at places such as the Plum Tree Island Wildlife Refuge and the Grandview Nature Preserve. Median annual housing costs. This reflects the city’s overall cost of living, and includes things like mortgage payments, property taxes and utilities. Total water area. The number of square miles of open water within the city. Water area per 100,000 residents. Number of warm weather days. This is the average number of days per year in which the maximum temperature exceeds 50 degrees. Frozen water is not great for boating (unless it’s ice boating you are talking about!). We ranked each of the 200 cities in our study according to those five metrics. We then averaged those rankings, giving equal weight to each metric. Lastly, we calculated a score for each city based on those average rankings. The city with the highest average ranking (i.e. the city ranked closest to first on each metric) scored a perfect 100. Cities with lower average rankings received lower scores.